A Childs Dream is pleased to announce support of Camp Laurel Foundation, Inc. A registered, non-profit organization founded in 1992 by Margot Andrew-Anderson. Committed to improving the lives of children living with HIV and AIDS, they believe that every child has the right to experience the wonder of childhood. Through their programs they strive to contribute to the development of each child’s self esteem, self awareness and self fulfillment. 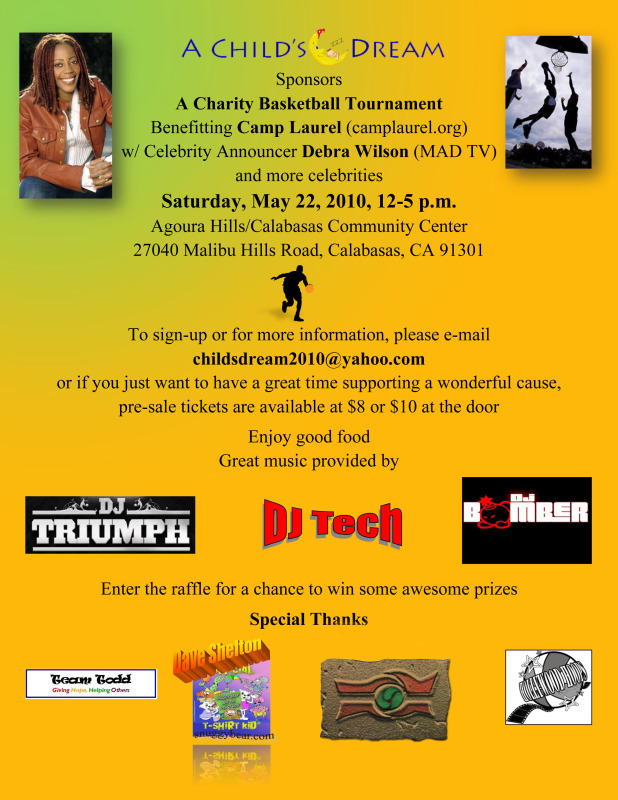 On Saturday, May 22, 2010 A Childs Dream will be sponsoring a charity basketball tournament benefiting Camp Laurel (www.Camplaurel.org) with Celebrity announcer Debra Wilson (MAD TV) along with other celebrity appearances from 12-5pm located at Agoura Hills/Calabasas Community Center 27040 Malibu Hills Rd, Calabasas CA 91301. Tina Faour and Kandice Yobe organized this event because they believe it is important to give back and to be involved in community service.Camp Laurel is free to all children across the country ages 6-17 and its existence depends on generous donations from foundations, corporations and private individuals. After discovering that there are currently over 25,000 children in the United States with HIV/AIDS and over 600 recorded children in Los Angeles County alone; Tina and Kandice became passionate about making a difference in these children’s lives. They are asking all local media to please help out and announce this special event that will be open to the public so that Camp Laurel can continue to contribute to each camper’s mental, social and spiritual growth.